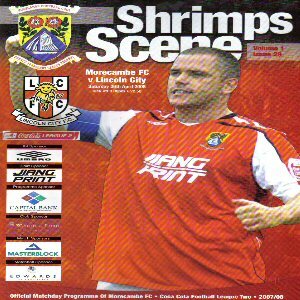 Our final away game of the 07/08 season was a chance to go to Morecambe's Christie Park. They had come up to the League 12 months earlier and I was quite looking forward to going. The only problem was that it did take a long time to get there once in Morecambe. Fortunately parking was plentiful, either £3 at the ground or street parking proving sufficient grounds for parking. I was curious about how to get into the away seated section and asked the ticketing bloke. Just like everyone I met in the town he was friendly but didn't really seem to know what he was on about. At times he was actually ignoring what I was saying and just saying stuff off of the top of his head. I eventually found out the answer after asking someone else. 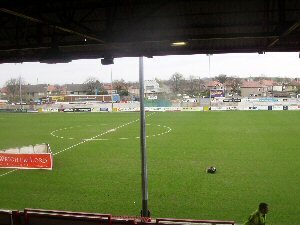 A quick walk through the terrace later and we came to the seated stand and the view was quite decent. 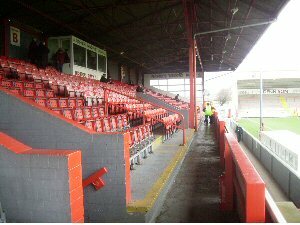 The seats had no back to them which was a little unusual and the leg space was non-existant, but other than that it was quite a decent stand. Looking out offered an unusual view of the rest of the ground. 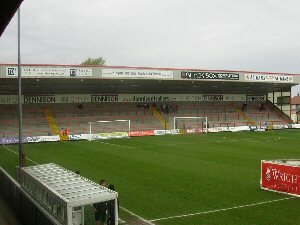 Opposite us was an empty space whereas either side was a terrace of varying size. From the seating you could see all the action fairly easily, that despite the presence of several pillars. 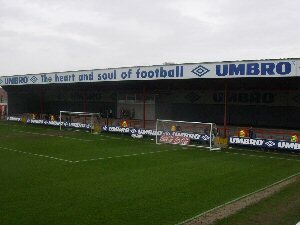 The atmosphere was fairly decent through and the Morecambe fans produced a lot of noise. They continued to sing even after they went behind and this is a rare thing in the lower leagues. Also, it was nice to sit five feet from the home fans with no segregation and not having to worry about any violence. I would certainly recommend Morecambe to anyone. It's not the best ground in the world but the day out is fantastic. One tip though, when at the chippy near the ground and the woman asks "salt and vinegar? "....just say "I'll put it on myself, thanks." I don't think I've ever had chips with that much salt on before.